I’m fairly new to iced coffee. Actually, by most people’s standards I’m fairly new to coffee altogether. My parents drink gallons but it never appealed to me (beyond the smell, which is awesome mixed with amazing)—that is until a visit in Italy in ’08. We had church every morning at 10:00 a.m. and between jet lag and staying up late, we were desperate for a pick-me-up at breakfast. Enter Lewlo, our awesome waiter/concierge, who hooked us up with as much free delicious cappuccino as we could put in our bellies. And I’ve been in love ever since. 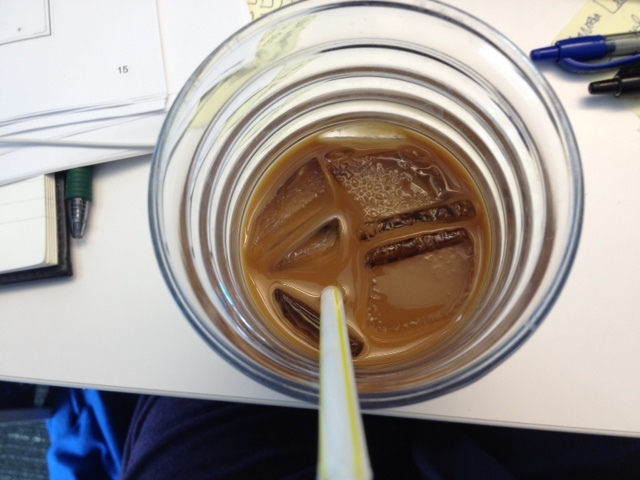 I normally drink the Nespresso at work (with a tiny bit of milk and two raw sugar packets, in case you care), but we also have Keurig machines so I’d tried making iced coffee a few times when the hot brew wasn’t doing it for me. 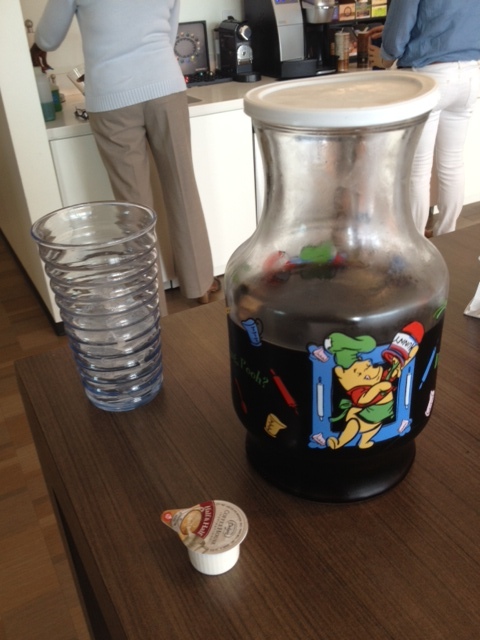 Unfortunately, it was super watered down and just…OFF. Then I read about the Pioneer Woman’s cold brew iced coffee recipe and it made perfect sense. I’ve tried it a couple times now and overall it’s awesome, plus I’ve found a couple twists that work for me. The best part? For the price of a venti Starbucks iced latte, you can make 2-3 weeks’ worth of iced coffee for yourself—$4 or so for the coffee, a tiny bit for milk & sugar, and you’re good to go. 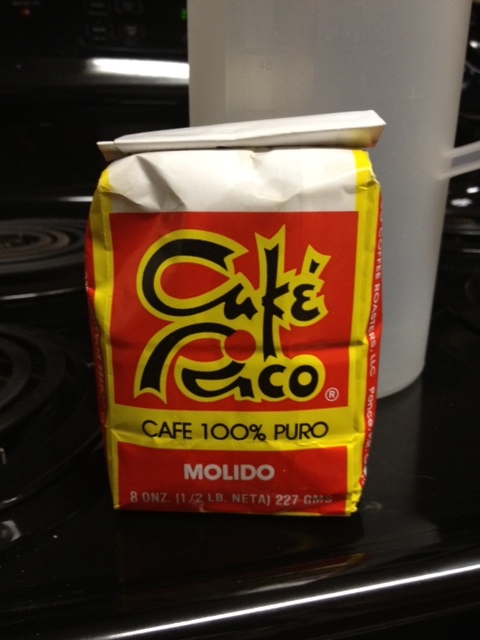 Got this is Puerto Rico because I loved their cafe con leche so much. Original recipe is here, plus I love her photography! The first time I made it I used some coffee I got in Puerto Rico (pic above), and last weekend I made it with some Cafe Bustelo (in a brick, not a can) that I got at the grocery store. Basically any coffee will work but I prefer it as rich and strong as possible. May have to try it with hazelnut sometime soon. Depending on the severity of your habit, this should last you a couple weeks or more. 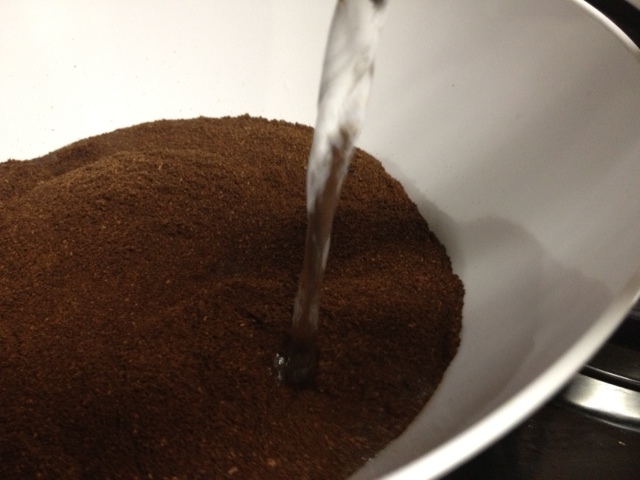 Stir it all up and make sure all the grounds get good and wet. It looks like those mud pies you made as a kid. 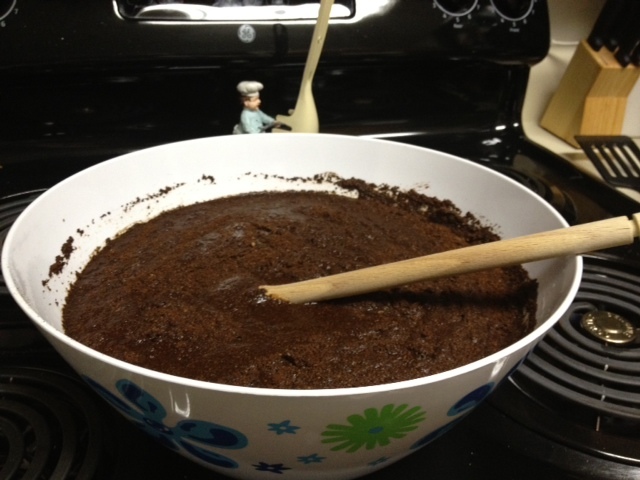 Or brownie mix. It’s kind of like you’re stirring dirt. 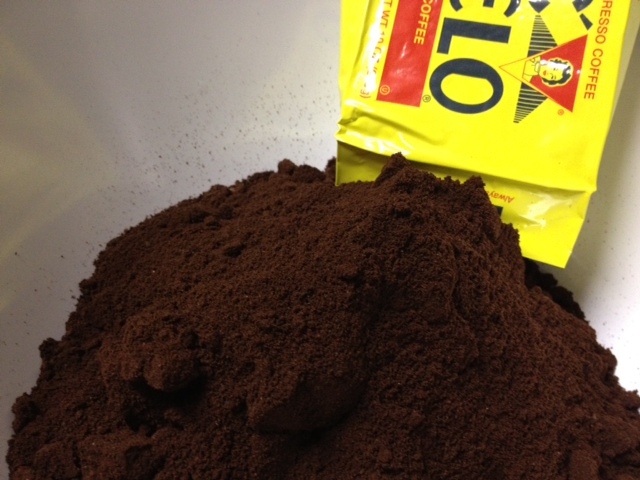 Delicious, caffeinated dirt. Seal it up with some plastic wrap (or if you’re fancy enough to have a big enough container with a lid, knock yourself out), and put it in the fridge for at least eight hours to let it steep. Next set up your straining station. 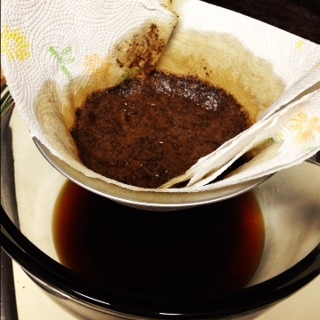 You’ll need something to strain the coffee into, and a sieve/strainer that’s the right size for it. 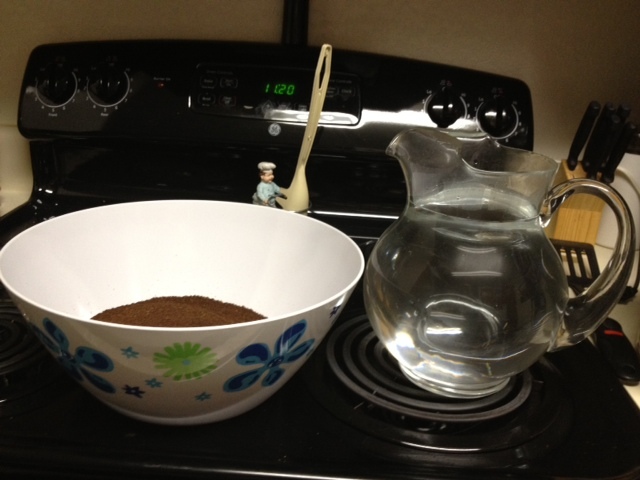 I picked one up at Target for like $5, and strain the coffee into a bowl. It’s kind of awkward, but best I can do with the dishes I have. Pioneer Woman recommends lining the strainer with a couple layers of cheesecloth, which I’m sure works really well. Unfortunately cheesecloth isn’t something I happen to have lying around, so I used paper towels and it works just fine. I’ve also thought about using coffee filters, though that could get kind of expensive. Anyway, line the strainer with something so you don’t get lots of extra grounds in your coffee…unless you just roll that way. 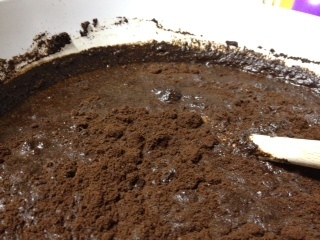 Then use a ladle or similar implement to start transferring some of the coffee mixture in the strainer. It will take awhile to filter through, so just be patient. If you’re using paper towels as a strainer, you’ll probably need to change them out a few times. Et voila! Cold-brewed coffee concentrate for all your caffeination needs. Refrigerate and keep sealed. Now she recommends just stirring in sugar or using sweetened condensed milk as a sweetener, which I’m sure is full of deliciousness and rainbows, but it’s also full of fat, sugar, & calories I can’t really justify. 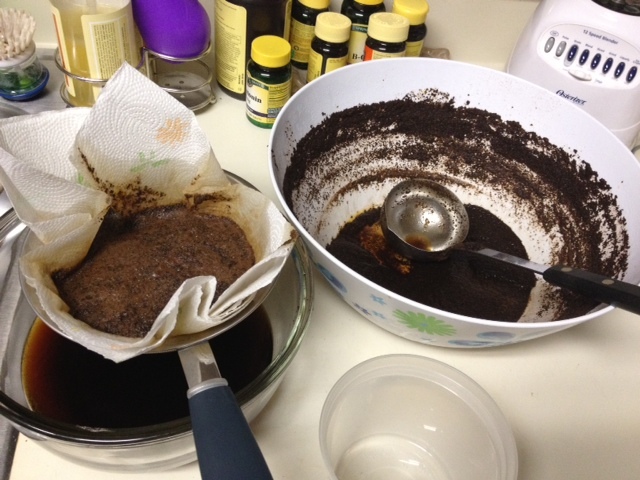 The first time I made the cup of iced coffee, I just added raw sugar like I always do. Bad idea. Why? Because sugar doesn’t really dissolve in cold liquid. And nobody likes crunchy coffee. Yes, the only pitcher I have that seals is Winnie the Pooh. What of it?? 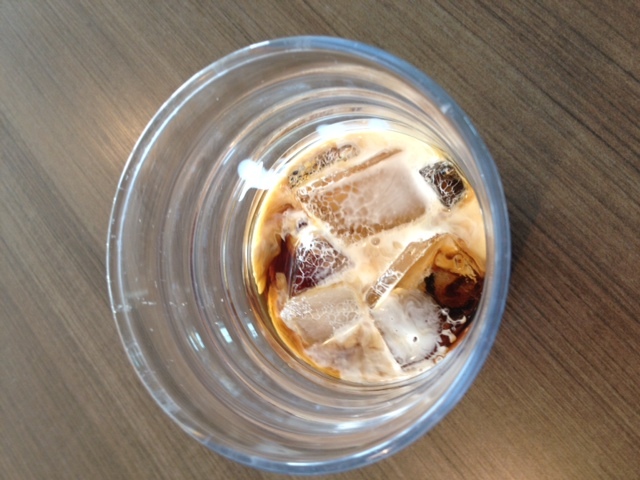 So I brainstormed and decided to make a little simple syrup, cool it, and add it to the iced coffee. I boiled sugar and water on the stove—not too much of either, but your taste will have to guide you. Bring it to a serious boil, then turn the heat down a little but let it continue to simmer boil for a while, stirring constantly so it doesn’t burn. It should reduce a little and thicken (maybe; thickening is not my strong suit). Let it cool completely and then you can either add it to your coffee concentrate (what I did) or just keep in a separate container and add as needed to your iced coffee. Not sure if adding it to the concentrate will make it go bad faster, but mine’s been fine for a week or two at least and quite frankly I go through it pretty fast. So let me know if you give it a try, and how it works out for you!